Q. How do I find out how many times my article has been cited using Web of Science? Web of Science is a powerful citation index resource that links to outside databases. You can use Web of Science to see how often your article has been cited. To do this, start by searching for the article. You can search by author and/or by title. On the right side of the listing is the number of times the article has been cited. You can click on the number to see all of the articles that have cited your article and on the left side of the page, you can see how many times per year it has been cited. If you don't see the year that you are looking for right away, you can click on "more options / values" to see older dates. 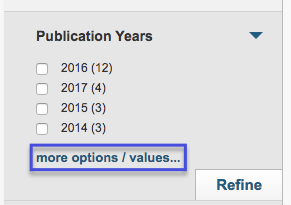 Clicking that link will take you to a new page, and you can select the publication years that you need to search in.